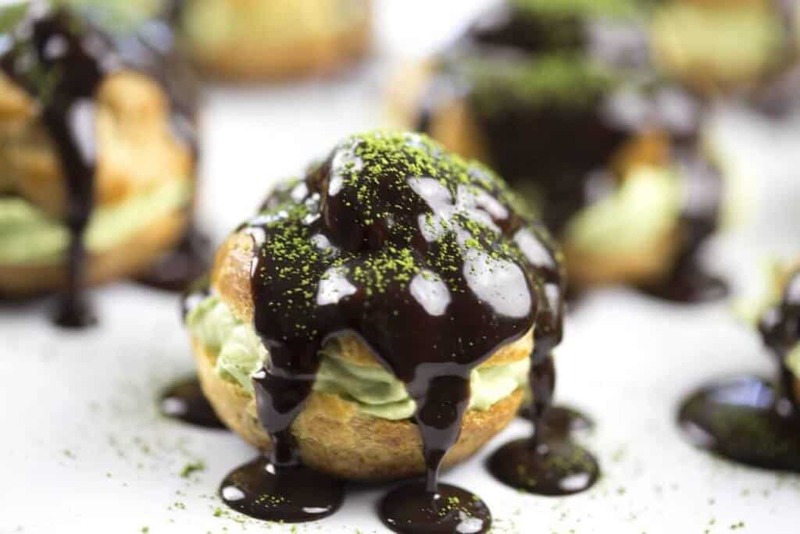 For a step-by-step of making the puffs click here! 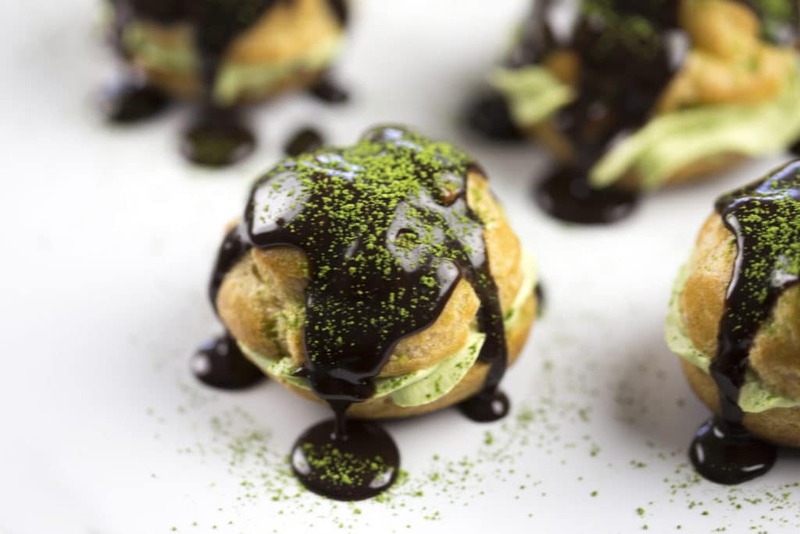 Choux puffs filled with matcha flavored cream and topped with a chocolate drizzle. 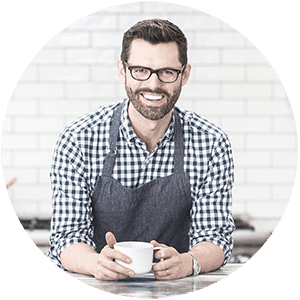 In a large saucepan, bring the water, butter, salt and sugar to a rolling boil over medium-high heat. When it boils, immediately take the pan off the heat. Stirring with a wooden spoon, add all the flour at once and stir hard until all the flour is incorporated 30 to 60 seconds. Return to the heat and cook, stirring, 30 seconds. Scrape the mixture into a mixer fitted with a paddle attachment (or use a hand mixer). With the mixer running, add 3 eggs, 1 egg at a time. Stop mixing after each addition to scrape down the sides of the bowl. The dough should be thick but should fall slowly and steadily from the beaters when you lift them out of the bowl. If the dough is still clinging to the beaters, add the remaining 1 egg and mix until incorporated. Using a pastry bag fitted with a large plain tip, pipe fat dots spaced 2 inches apart onto a parchment-lined pan. Whisk in 1/4 cup of the hot milk mixture until incorporated. Whisk in the remaining hot milk mixture, reserving the saucepan. Pour the mixture through a strainer back into the saucepan. Let cool slightly. Cover with plastic wrap, lightly pressing the plastic against the surface to prevent a skin from forming. Chill at least 2 hours or until ready to serve. The custard can be made up to 24 hours in advance. Refrigerate until 1 hour before using. Egg Wash: In a bowl, whisk the egg and water together. Brush the surface of each eclair with the egg wash.
Once cooled you can cut the puffs in half and pipe the pastry cream or you can poke a hole in the bottom and pipe through there. For the glaze pour the hot cream over the chocolate, add the coffee and vanilla then stir and melt in the microwave. Stir again then set aside. 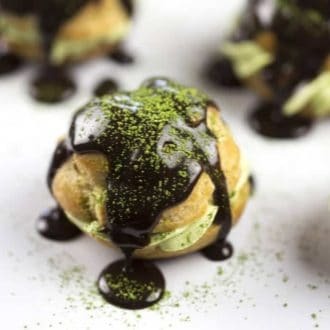 Once cooled, spoon the glaze over the profiteroles and garnish with crushed pistachios if desired. For the sake of this recipe, add green tea powder.